Most of my blog posts have been about sweet stuff and baking but this time I had to change my mind. Sometimes there is just a meal you eat that totally blows your mind away that you just have to write about or try to recreate when you get home. Two years ago my family and I spent our summer holiday on Ibiza. I had always turned my nose up at Ibiza (sorry for sounding so snobby) because I didn’t fancy going somewhere which I thought of as just being like Blackpool with sun and palm trees. I thought English Breakfasts, pubs, fish and chips would be the norm. Dont get me wrong I love my British food and I’m proud of being British but when I go on holiday I want to experience what culinary tastes that country has to offer or “that foreign muck” as my late grandad once said to me when I served him with lasagne! I had to eat my words. Once we got away from the other football shirt rowdies that we shared the plane with who were tanked up on ale at 6am in the morning, we found Ibiza in all it’s glory. Ibiza as it should be. I have never been a huge fish or seafood eater but on the first lunchtime we were in Santa Eularia and were sat in a lovely restaurant by the marina. I think it was called Skuma. I saw a sizzling plate of garlic prawns heading towards the next table of customers and was immediately presented with a smell of garlic so delicious I just had to try. My hubby was exactly the same and we had to order some. Along with a basket of bread, olives and the moreish alioli (a type of garlic mayonnaise) we were in foodie heaven. The large prawns must have been baked in large terracotta or iron pots with huge slivers of garlic, a couple of whole chillis and sprinkled with what looked like either cayenne pepper or paprika. I think it was the latter, the Spanish smoky paprika which I can’t buy enough of. 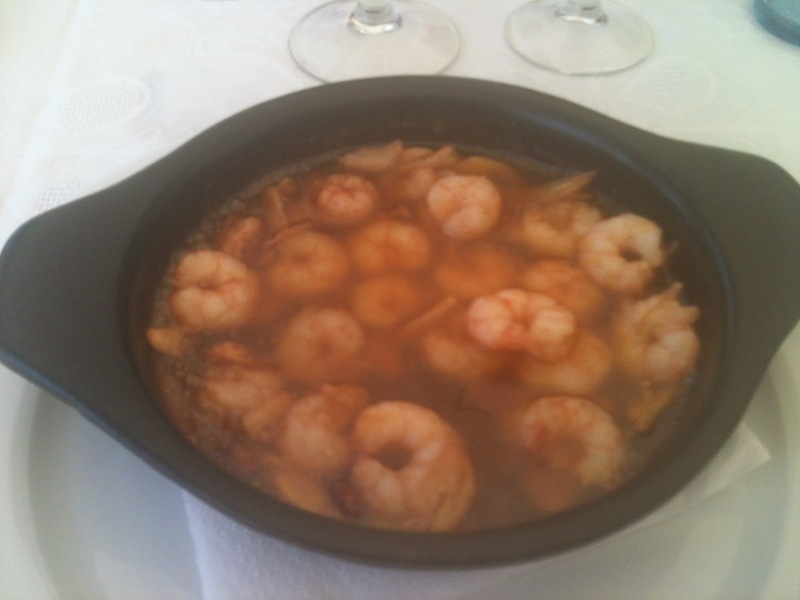 The prawns sat in sizzling chilli/ olive oil which married perfectly with the crusty fresh bread. Last year we ate garlic prawns again on holiday in Menorca and once again revisited our experience again in Ibiza this year. However, last year I made a terrible mistake and tried ordering them in Spanish (I can speak French but my Spanish is dreadful). Along came 6 massive prawns the size of lobsters with their heads and tails still intact staring up at me! My kids and hubby still won’t let me live it down even though my daughter’s the one taking GCSE Spanish! Having said that, they were still delicious though it was wierd seeing their funny eyes looking up at me! Once we got home both my hubby and I wanted to recreate the garlic prawns ourselves. My hubby loves cooking and experimenting on a Saturday night and once he cooked them for a dinner party with friends. He played it by intuition but I have been looking for a recipe. The other recipe I spotted was in the lovely Sam Stern’s Student Cookbook, which made me laugh as all I seemed to live on when I was a student was baked beans and pot noodles! !